This is a continuation from my last article Distribute Process using Packages. In this article, I’m going to discuss how to deploy a Process/Flow using the Force.com IDE. 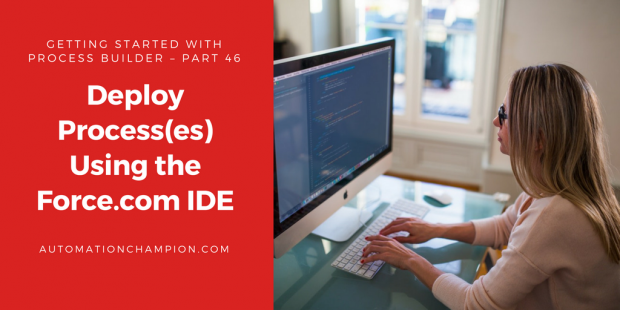 The Force.com IDE is a plug-in for the Eclipse IDE. The Force.com IDE provides a unified interface for building and deploying Force.com applications. Force.com IDE allows us to deploy the Flows and Processes in different environments, for example, Developer Edition org and Production Org. Let’s start with a business use case. Pamela Kline is working as System administrator in Universal Container. She has developed a Process (Auto update new use Chatter email settings) in the Developer Edition Org and done with testing. She wants to deploy this process to their Organization Full Sandbox. There are a few possible solutions for the above business scenario, but we’ll use Force.com IDE to deploy the process from Developer Edition org to Full Sandbox. Before proceeding ahead, you have to install the Force.com IDE. Refer this link to download, install and configure Force.com IDE on Eclipse platform. Follow the below instructions to create a Project and deploy it to another Salesforce org. 1. Open Eclipse IDE, click on File | New | Force.com Project and enter your project name and credentials, as shown in the following screenshot. 2. After logging in, Click on Selected metadata components radio button and then click on the Choose button to select the components that you want to include in the project, as shown in the following screenshot. 3. The next step to retrieve exact metadata components, which you want to deploy. In this demo, you’re going to deploy the Process Update_Chatter_Email_Notification-1. Flows and Processes will be listed under the Flow folder, as shown in the following screenshot. Once you’re done with components selection, then click on the OK button. 4. The confirmation window will contain all of your selected metadata components. Click on the Finish button, and you will get all your selected metadata into your workspace. Your project should now look like the following screenshot. 5. The next step is to deploy it in our Full Sandbox environment from our clean project by right-clicking on the Flow (Update_Chatter_Email_Notification-1) and selecting Force.com | Deploy to Server, as shown in the following screenshot. 6. The final step is to select the components that you want to deploy, in this demo we’re going to select the component Update_Chatter_Email_Notification-1, as shown in the following screenshot. 7. Once you’re done with the component selection, then click on the Next button to deploy the Process to Full Sandbox. After Successful deployment, you will get the message shown in the following screenshot. 8. At last the final step is to activate the deployed process. To do that navigate to Name | Setup | App Setup | Create | Workflows & Approvals | Process Builder and open the deployed process. Active the Process by clicking on the Activate button. Note: – For this demo, I have used Eclipse Kepler (Force.com IDE v33.0). Thanks! So much. So I used Force.com IDe with Exclipse and followed all the steps. i got the successful Deployment message with 2 warnings about code coverage results. I did not see the update in my production org. I had deleted an APEX Class. NOte: I was able to delete two other classes just before this using the same methed. Any suggestions? Also the Class I am trying to delete has code coverage of over 80%.